Twelfth-century, French donation by Georgia, daughter of Henri de Columbirs and former wife of Hugh de Lonchamp, of the rent of ten Tournai sous, to the church and convent of the Holy Trinity in Caen to be used to maintain a perpetually burning lamp before the altar of St. Lawrence on St. Lawrence day. Produced at the Abbey of-aux Dames (Cottineau 1:553) and dated August 1222 in the document. The Benedictine Abbaye-aux Dames of St. Trinité in Caen, Normandy, was founded c. 1066 by Queen Matilda, wife of William the Conqueror, who is buried there. An inscription on the plica in a later hand: "1222 donation a la chapelle de St laurent dans l'abbaye de Ste Trïnite," translation: "1222 Gift to the chapel of St. Lawrence in the Abbey of the Holy Trinity." On dorse: inscription in a hybrida hand (fifteenth-sixteenth century) indicates that the family home was later still known as Calumbiers (Coulombiers); possible scribal signature; six-line inscription in French summarizing the document. Acquired from the collection of E. H. Dring and purchased by Special Collections, Waldo Library from the Mackus Company, Fairlawn, Ohio May 8, 2000. Acquisition record in "Mackus Company" folder. Housed in a modern, pink mat frame (443 x 323 mm); visible on one side only; remnant of a green wax seal appended to the parchment tag. Chibnall, Marjorie, and John Walmsley. 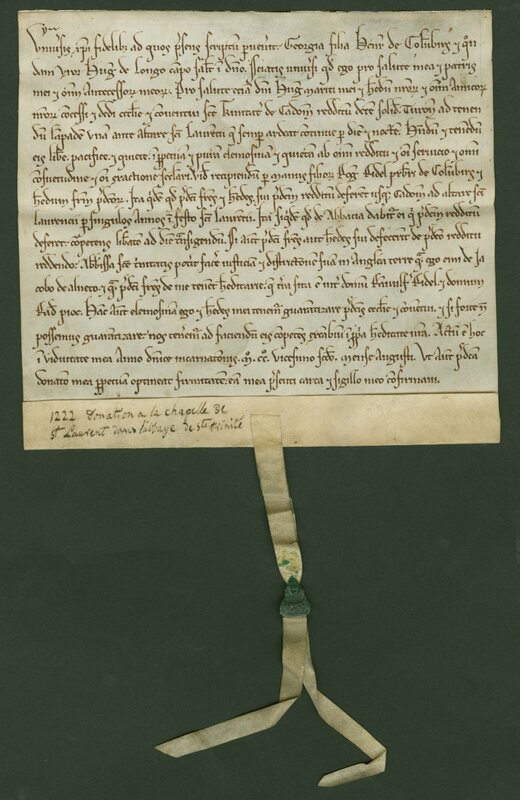 Charters and Custumals of the Abbey of Holy Trinity Caen. Records of social and economic history, new ser., 5, 22. London: Published for the British Academy by the Oxford University Press, 1982.